This is one of the most common hoof problems that we see on a routine basis. 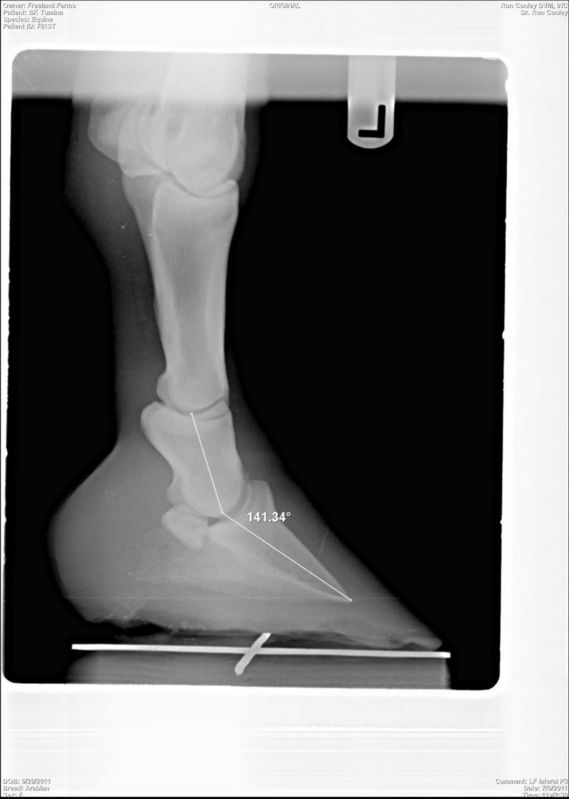 In normal foot conformation, the angle of the hoof wall matches the angle of the pastern. In long toe - low heel syndrome, the slope of the foot exceeds the slope of the pastern. This tendency can be due to the horse's conformation, or can be brought on by improper trimming and shoeing methods. This is a serious problem that can lead to a variety of lameness issues. With a long toe - low heel, the center of the weight is in front of the point of the frog. The added effort required to force the foot to break over the long fulcrum makes it more difficult for the heels to rotate around the toe. This causes tension in the deep flexor tendon to be prolonged or exaggerated, and can lead to bowed or strained tendons. Also, the navicular ligaments which stabilize the navicular bone can be stretched beyond their normal limits leading to navicular problems. Long toe length can also contribute to injuries of the suspensory ligaments and the proximal sesamoid bones. At one time, it was fashionable to shoe horses with a longer toe with the belief that it led to a longer stride. That theory has since been disproven. Horses shod with long toes impact the ground toe first. This stabbing of toe into the ground results in a jarring, rather than smooth, action. Horses shod with long toes behind often have an unevenness of gait. 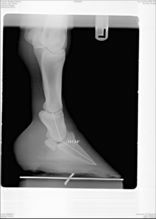 The radiographs below are of a horse that became lame after developing long toe - low heel of the left front hoof. Her front fetlocks and coffin joints had been injected with little improvement in gait. Radiographs were taken of the left front. The veterinarian and farrier coordinated a shoeing plan as is typical in our Performance Shoeing Program. When comparing the before and after views, you can see that the corrective shoeing made a dramatic change. Evaluation of this horse one week later showed no lameness at all. It is remarkable how much pain and discomfort can be caused by the improper trimming or shoeing of a horse. The correction for long toes is to shorten toe length, often moving the shoe back ¾ to 1 inch. The entire heel is left. Frequently a 3° wedged shoe is used to help raise the heel. The horse is shod full from midpoint of the hoof back. This means the hoof can be seen sitting on the shoe to prevent crushing of the heels. The shoe should extend behind heels to sit approximately below the coronary band. It may take several trim and shoeing cycles to bring the hoof back to normal. 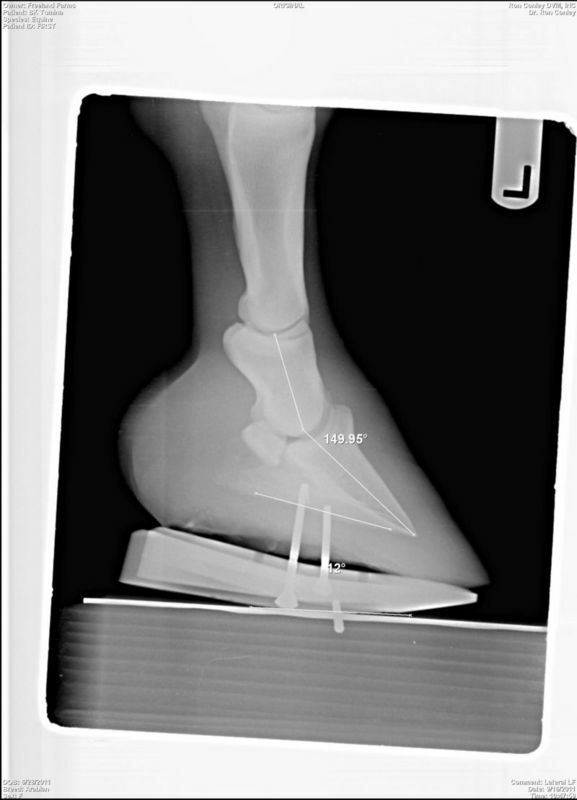 In our Performance Shoeing Program we radiograph hooves so that the farrier can perform his best work. 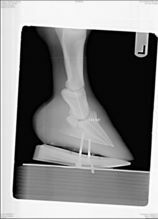 As veterinarians, we evaluate the radiographs and measure hoof angles, sole depth, and degrees of rotation that we could only guess at without the benefit of radiographs. The farrier uses this important information to implement the necessary shoeing adjustments. If you have questions or concerns regarding your horse's hooves, please contact Conley and Koontz Equine Hospital at 877-499-9909 or info@ckequinehospital.com.